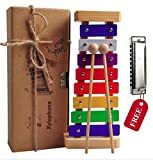 Xylophone is a participant in the Amazon Services LLC Associates Program, an affiliate advertising program designed to provide a means for sites to earn advertising fees by advertising and linking to Amazon. Certain content that appears on Xylophone comes from Amazon Services LLC. This content is provided 'as is' and is subject to change or removal at any time.